Guys..... These were limited production, only made in one color (VO) and fairly hard to find. Read the thread!! All your questions and more have been answered a bunch of times. Warren Buffet would have approved! Yea... I am kicking myself too. We should have - that day at Leipzig! They should send us 1m owner for free!!!! Or let us to buy it before others at least!!! I just called my dealer to buy the very last 1:43 VO 1M scalemodel they have in their showroom displays. They had 3 or 4 of them the last year. Going to collect it tomorrow. Good for you! If youre not a fan of the VO (being its not AW and all) I will take it off of your hands! Noop. The 1M models were sold thru the German dealers too. BMW made(or rather has the Chinese model maker make) 1K 1M models. And then I think it was Scott26 who said they made a 2nd batch. When I was at Leipzig Werk with Papethova - they only had 200 models for sale - at discount prices bmw employees. At least that is what the guy at plant told me. When I was at Leipzig Werk with Papethova - they only had 200 models for sale - at discount prices bmw employees. At ;least that is what the guy at plant told me. They are VERY hard to find. I have asked my German dealer a few times to try and reorder more 1M models. Always the same... no more are made. 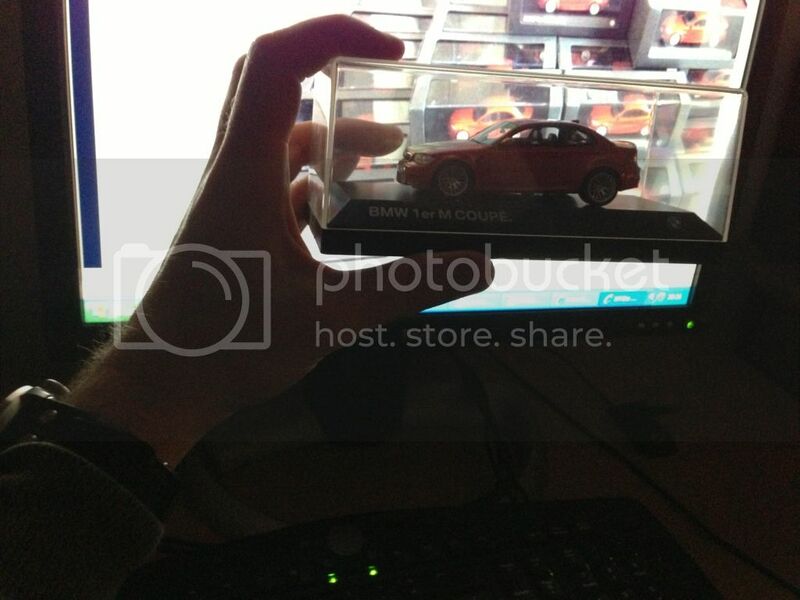 Even when I heard that BMW was making a 1:43 scale model it was in April I think... I told me dealer to order one for me... the model did not arrive until June! Normally parts come the next day. When Pap and I were at Leipzig that was in Sept(I think>?) that was the last time I saw the models sold at any BMW place. Not even at the Welt did they sell them! Most of the models were sold to bmw insiders and thru their (German)dealer network. Sometimes I see them on ebay.de for ridiculous prices. They actually did sell them at the Welt shop. I bought 2 of the 6 they had in stock in August 2011. I posted on this site while I was at the welt asking if anyone wanted one, but didn't get a response back until I had left the welt, and then got several requests. I forgot to take into account the time change. I now wish I would have bought all 6 at the time. ^^Thanks guys for clearing up my memory. I've been to the Welt and Leipzig so many times its all a blur. On Aug 30, 2011, 63 1M die cast models were sitting arms length for Dackel at Leipzig Werk. I wish someone made a 1/18 scale already. Let's stick to the 1/1 scale. Now I feel even worse for dropping my model off my desk! Stupid scratch near fuel door and the windshield popped off... So pissed! See, if you had bought a VO car you could use your car touch up paint.